Arun dada is a wonderful soul and wandering minstrel who has spent over 60 years of his life in service to humanity. Full of stories of wisdom and songs of maitri, even in his ripe old age, he is ever ready to entrall all those who visit his humble home. 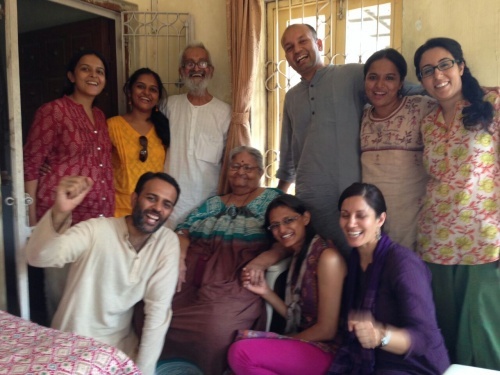 Recently, a few of us visited an elderly Gandhian couple in Baroda, Arun Dada and Mira Ba. Now in their 80s, their entire life has been rooted in generosity. As students of Vinoba, they have never put a price tag on their labor. Their presence speaks to a life-long practice of equanimity, trust and compassion. And so do their stories. Incidentally, Arun dada's home was the sacred space from where Maitri Tunes kicked off earlier this year. Zindagi hain dil ki dhadkan, ye bataane aaye hain. Usko na jaagir kehna, yeh bataane aaye hain. I come carrying a message of love to your house, this body is tired now, yet my life is an offering to you. This world is beautiful because of the offerings of so many beings. I have come to pay my respects to those noble ones. Country, religion, caste, language all these are limited identities. I have come to remind you that ultimately life is your very own heartbeat. This land is a gift to us from the creator, I have come to remind you to consider yourself a trustee of this gift.